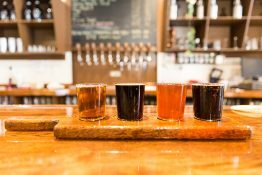 North Carolina Beer Month kicks off in April with a month of beer-related events, and the breweries on the Jackson County Ale Trail in Western North Carolina are worth stopping by to taste the brews while taking in Jackson County’s scenic views. Just an hour west of Asheville, beer lovers find three micro-breweries that offer less crowds, innovative flavors and some of the friendliest brewers around. In historic downtown Sylva, the small-town vibe and laid-back atmosphere make sipping suds relaxing, and you’re even likely to chat it up with the head brewers themselves. 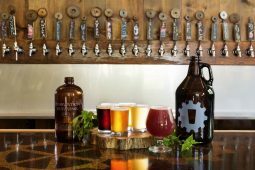 The Jackson County Ale Trail located in Sylva features three breweries: Heinzelmännchen Brewery, Innovation Brewery, and Sneak E. Squirrel. The popular Sylva Brew Hop is back for NC Beer Month on April 1 from 3 to 7 p.m. In honor of NC Beer Month, join City Lights Café, Heinzelmännchen Brewery, Innovation Brewing, Mad Batter Food & Film, Sneak E Squirrel Brewery, and The Cut Cocktail Lounge for the Sylva Brew Hop. In its 2nd year ticket holders will visit each of the establishments and taste 2 local or regional beers. Tickets include a souvenir glass and two pours at each location. We encourage folks to take advantage of our awesome restaurants in Downtown Sylva during and after the Sylva BrewHop. Tickets are $25 per person and can be purchased online: http://citylightscafe.com/sylva-brew-hop.html through March 30, 2017 or at gate on day of event $35 per person. Heinzelmännchen Brewery’s name isn’t the only thing that’s German. Co-owner Dieter Kuhn was born in Heidelsheim near Germany’s Black Forest, and grew up with an uncle who malted grain for beer, so his desire to brew started early. Heinzelmännchen was the first brewery on the scene in Sylva, where it opened in Sylva in 2004. The small brewery turns out altbier — the style brewed in the warmer regions of Germany since the early days of brewing, featuring a light and refreshing taste. True to German tradition, the brewery serves warm Bavarian soft pretzels, a perfect companion to beer. Ancient Days Honey Blonde Ale- This pilsner style ale is well-balanced, refreshing, crisp and smooth and made with Catamount honey. 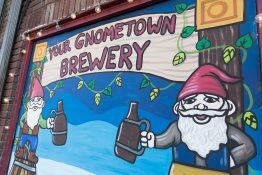 Weise Gnome Hefeweizen- A light bodied, clear wheat ale that has a refreshing tartness, white frothy head, carbonation that tickles the tongue and a crisp, slightly hoppy finish. Dunkel Weise- This is a dark version of our Weise Gnome Hefeweizen. A touch of caramel wheat and dark crystal malt produce a full bodied and crisp wheat ale to enjoy in warmer evenings of late summer. NC Beer Month events: April 22 is Heinzelmännchen Brewing’s anniversary, and for their 13th year, they will be hosting an anniversary party at the brewery. This is the same day as Greening up the Mountain, and in addition to their anniversary party, the brewery will host a beer garden at the festival for all those of-age to enjoy their brews. Innovation Brewing is now in its fourth year, and its name is true to its beers, featuring both traditional brews and a number of seasonal and experimental beers. The seven-barrel brew house turns out more than 30 beers on tap, with 12 year-round favorites. Innovation’s Cosmic Carryout food truck is permanently parked at the brewery, serving up a variety of hand-made burgers, veggie burgers and hand-cut fries seven days a week. From the mainstays, Afternoon Delight Blonde Ale, Hoppy Camper, Midnight Ryeder IPA. From the Rotating, based on season, find beers that have ingredients ranging from poblano peppers to beets, basil and cucumber. Hours: Sunday-Saturday 12 p.m. to 12 a.m.
NC Beer Month events: Innovation Brewing is releasing a special sour beer for NC Beer Month. The brewery will also host a chocolate and beer pairing. Sneak E Squirrel is the new kid on the block, converting a former car dealership into a brewery. Owner John Duncan named the brewery after his online gaming handle, and between the beers and food at Sneak E. Squirrel, there are plenty of unique offerings. The 13 beers on tap are well-balanced and feature classic styles, while a French press method allows guests to make their own hop infusions. A full menu is available at Sneak E Squirrel with a variety of specialty game meats, nachos, finger foods and more. Rehaks Red Leg Red Ale- A well-balanced copper color ale with a complex hop profile. Clockwork Zombie- A Belgian Wit with added pomegranate and cherry. Parrot Porter- Combines the best of the stout and pale ale characteristics, this dark brown beer is sweet and malty. Get the Frack Out Stout- A rich, Irish-style stout. NC Beer Month events: The Sneak E Squirrel will be celebrating NC beer month by re-releasing some of their most popular experimental beers, known as the Beer of the Week. April will start off with the hugely popular “Bad Juju IPA.” On Easter, the “Palm Sunday Ale” and “Easter Bunny” will be on tap. The month ends with a seasonal tribute to spring, the “Cherry Blossom IPA.” Sneak E Squirrel’s kitchen will be turning out weekly food specials to pair with special weekly beers. Friday evening April 21, Sneak E Squirrel hosts a beer-themed Murder Mystery dinner. Sneak E Squirrel celebrates homebrewing in NC with special homebrewing classes at the brewery. All events available to view at www.sneakesquirrel.com/Events.html. Baxley’s is offering a special chocolate box for April in which they include chocolates to pair with specific beers. It will include a beer pairing guide which describes the chocolate and tells you which beers go well with it.